Encouraged by Sophie, who tells me that I offer her THE SAME THINGS EVERYDAY, I made some banana bread this week for the kids to have for breakfast. 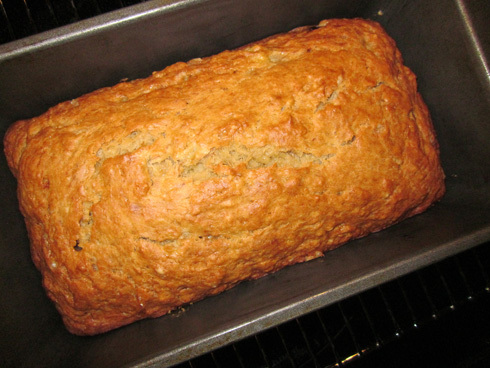 I have a few banana bread recipes I like, but they are kind of high in calories. I like to keep the amount of calories I consume for breakfast pretty low, mostly to save them for the foods I know I’d rather consume later in the day. I made one recipe that was pretty good and reduced the calories, but it was a bit on the dry side. I made a few changes and boosted the flavor by adding a little salted caramel sauce. The result was terrific – moist, lighter in calories, and flavorful. So good, it didn’t even need any added butter. Although caramel sauce is not hard to make, it can be a little temperamental if you don’t do it properly. The first batch I made hardened immediately and could not be salvaged. So, I decided to reduce the steps and make a modified version of a traditional caramel sauce. As a result, the sauce is lighter in color (more of a blonde than a caramel) and more liquidy – BUT, it takes much less time and does not require any real skills or equipment. It is a great way to add the flavor of salted caramel to the bread with less effort. And since it is used IN the bread and not as a topping, it is a shortcut well worth taking. Preheat oven to 350 degrees F. Spray bread pan with cooking spray. In a sauce pan over medium-low heat, add first three ingredients. When it starts to bubble, reduce heat to low and stir until sugar melts and the mixture turns a light golden color. Add fleur de sel and margarine, stir until everything is well mixed. Turn off the heat, but keep the pan on the burner to just keep the caramel sauce warm. In a large bowl, mix remaining margarine and sugar. Add applesauce, egg and vanilla, mix until well combined. Stir in bananas, mashing bananas with spoon if needed. In a separate bowl, combine flour, baking soda, kosher salt. In two batches, add to the banana mixture, stir until everything is well mixed. Pour in caramel sauce and stir. Spoon all of the contents into the prepared bread pan and bake for 45 minutes. Remove from oven and set on rack to cool. – For recipes like this, I LOVE using bananas that have been frozen and thawed. I let the banana thaw in the refrigerator overnight or microwave it for a bit if I need it right away, snip one end off of the banana, and squeeze the contents into the batter. It is perfectly mushy already, and is a great way to use super ripe bananas. No matter how you thaw the banana, be sure to put it into a container, they leave behind a mess when they thaw.